Hank Thompson died on Tuesday. Another great country singer gone ... and so soon after Porter Wagoner. I've told this story before: I was introduced to Hank Thompson by none other than Roger Miller in the early '80s when Hank played at the Line Camp in Pojoaque. That was a wonderful night for my ego! 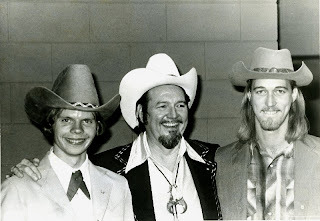 I still remember sitting around the Line Camp dressing room with Roger and Hank. "Steve's from Oklahoma City," Roger said. "He's from Reno Street." (That was an area of downtown OKC once known for its rough bars.) Hank, who used to have a televison show in Oklahoma City, got a kick out of that. A few years earlier, when Hank played the old Ramada Inn bar on Cerrillos Road, my date and I were asked by the management not to dance. I guess a couple of hippies doing the Reno Street Swing or whatever it was was intimidating the regular customers.